Happy New Year!! Is there any particular type of dish that you eat on New Years? 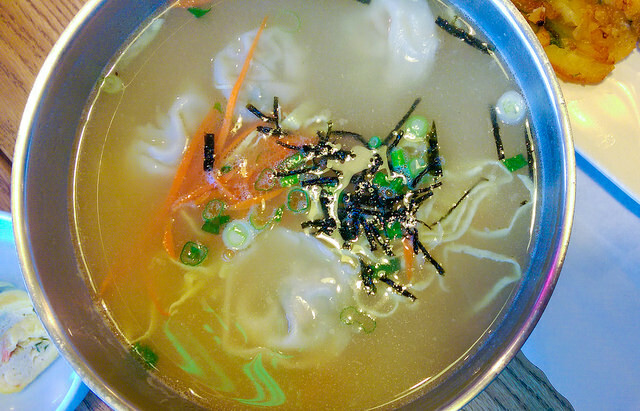 Roll House’s tteokmanduguk has sliced rice cakes and kimchi dumplings in hot soup, with green onions, carrots, seaweed, and egg. In Korea people cook a rice cake soup called tteokguk on Lunar New Year’s morning. 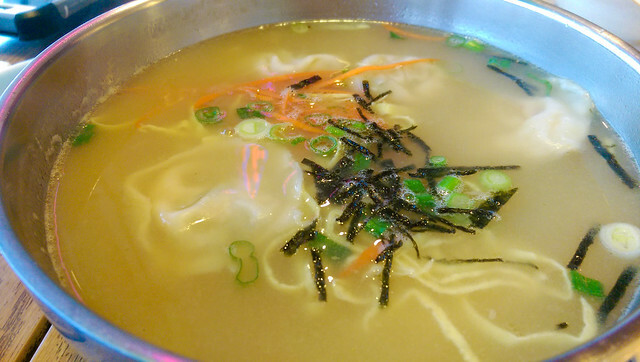 The soup has a clear beef-broth base, which becomes creamy and thick once the sliced rice cakes are simmered in the boiling broth. There are several reasons why Koreans eat tteok guk on New Year’s Day. Traditionally, one more year of life was added on this day and eating a bowl of hot tteok guk was a must in order to do so. This custom originated from the belief that one must spend the first day of the year solemnly and cleanly. The white colored foods symbolize this rejuvenation. In addition to this religious custom, sticks of rounded rice cake symbolized wealth and longevity. Cutting these rice cake sticks into pieces meant increased wealth, since the round shape of sliced rice cake resembled coins. Cooking tteokguk also saved a lot of time for busy housewives and serving this simple, yet nutritious, New Year’s breakfast eased the weighty burden of feeding their family. Eating Tteok guk today is more than just tradition. According to a nutritionist, “tteokguk was an excellent dish to feed the family a nutritious meal during the winter. The beef and rice cake makes such a great combination. The beef is rich in protein and minerals that improve metabolism and bone health. Rice cake is a great source of carbohydrates.” Clearly, the dish reflects the wisdom of older generations who first created tteokguk.